Its no secret that runners need to hydrate. Sometimes drinking enough water before a run is sufficient, but for long runs, or runs in the heat, carrying water can become a necessity! In my years of running I’ve had a love/hate relationship with different types of water bottles and hydration packs designed for runners. While I was in the Marine Corps, I often used a Camelback Hydration Pack similar to this to stay hydrated on hikes and long runs. I’ve also used a camel back hydration belt with a single bottle. The Hydration Pack worked pretty well, though it added a lot of extra weight to my back, it was pretty evenly distributed. The belt with the single bottle, not so much. I liked that I didn’t have to carry a bottle in my hand, but the belt moved around much too much (causing chafing) and the bottle would move around and dig into my back (not pleasant). Carrying a bottle in hand has always been a “last resort” option. First, I don’t like having extra weight in one hand. Second, I don’t like having to grip something while running, this often times causes some cramping or discomfort in my hand. This brings me to the Camelback Arc Quick Grip. I won this bottle in a twitter contest from @runchat. You can read all about it in my #RunChatHunt Blog Post. I was excited about winning this prize because, aside from my previous reservations about carrying a water bottle, this one in particular looked like it would change my mind and make for a great running experience. Did it? Read on to find out! 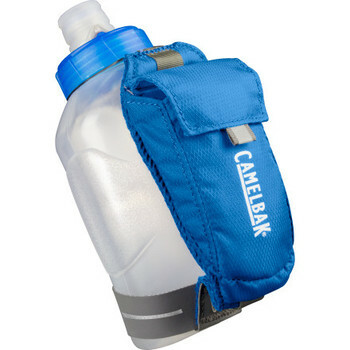 The Camelback Arc Quick Grip is a lightweight bottle made to fit snug on the hand during running. It’s essentially a Camelback Arc water bottle with a “Quick Grip” accessory attached. So, the bottle can be easily attached to a Camelback belt if that is your preference. For me the “Quick Grip” attachment is the best feature. The reason I feel this way is because I can slip it on my hand, let my hand relax and it will still be secure. The fabric on the bottle attachment that “grips” your hand is actually breathable and moisture wicking, so no need to worry if your hand sweats during the run. There is also a strip of fabric which can be pulled to tighten the grip, as well as a quick release hidden under the pouch to loosen it up again. Finally, there is a pouch on the outside of the grip which can be used to store keys, id cards/credit cards, gels/gu, shot blocks/gu chomps, and other small items of your choice. There are 2 pockets on the pouch, 1 which can be velcroed closed, and one that can’t. There is also a little tab on the pocket with a small reflective strip. As for the bottle itself, it is a 10 oz bottle which is a standard Camelback Arc form factor. As I mentioned, this can fit in other Camelback accessories including various belts. The top of the bottle has a locking mechanism which keeps the water in, though even if the lock is open, the “spout” of the bottle will only release water if it is bit. Think of the spouts on the end of the tubes on Camelback Packs, but on a bottle. It is quite simple and not messy at all to get water during a run, though it does get a bit tricky when the bottle is very low. Likes: There is a lot to like about this bottle, so much so that I have actually considered carrying this in my hand during a Marathon. Lightweight – The light weight means no arm fatigue during running. This also allows for natural arm and hand motion, keeping running form in tact. Comfortable – The grip is extremely comfortable on the hand and can be adjusted as well. Built in storage – This makes it easy to bring some essentials along during a run. Secure – The locking mechanism on the lock keeps the water in, the secure spout allows you to drink without making a mess! Compatible – Can be used with different Camelback accessories. Quality materials – The quality of the bottle and pouch doesn’t feel cheap at all. Dislikes: My dislikes are mostly areas where I feel the Camelback Arc Quick Grip can be improved, but doesn’t outweigh my positive impressions. Small bottle – The bottle being small contributes to its light weight, but it also limits how much water you can carry to 10 oz. This is not much during long runs, unless you are able to re-fill along the way. Small pouch – While the pouch is big enough to carry many essentials, it is much too small to carry a modern day mobile phone, iPhone or Android. Reflective? – The pouch only had a tiny strip of reflective material; could use more. 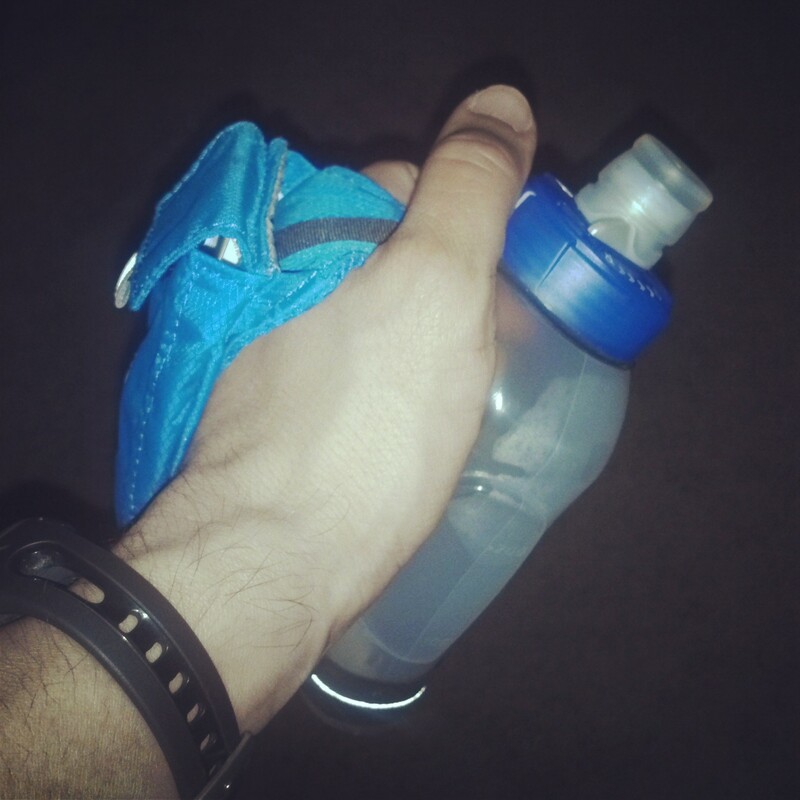 The Camelback Arc Quick Grip is a great bottle for runners who don’t mind holding something in their hand. While some runners may prefer to wear belts or hydration packs, they are not for everyone. I love that this bottle doesn’t restrict my range of motion in anyway and doesn’t weigh me down. The pouch is an added bonus but the real selling point is how comfortable it is. I can run miles with this bottle and completely forget its on my hand. While 10 oz of water isn’t much on, lets say a 16 miler, its perfect for shorter and middle distance runs and on long run routes where there is ample opportunity for a refill. If you’re going for a longer run on trails especially in hotter weather, you may want something more substantial though. This entry was posted in Gear, Reviews and tagged belt, Camelback, drink, grip, hydration, lock, pack, pouch, Run, spout, trails, water. Bookmark the permalink.